There are TWO different groups STUDENT GOVERNMENT & CLASS COUNCIL at Pinckney High School which you can be involved in. The Student Government/Class Council is the voice of the student body, it is made up of a group of students that represent each class in the high school. Student Government organizes many events homecoming dance/parade, pink-out football game, teacher appreciation week, and a lot of community service projects and more. There are FOUR Representative positions available. The HS also appoints 3 reps if you don't get elect your interest in running could help you get appointed. ​Class Council sponsors various activities such as the Homecoming Parade Float and Class T-shirts design, and other responsibilities. There are EIGHT Representative positions in addition to President, Vice-President, Secretary and Treasurer. The Vice President and Secretary move between Class Council and Student Government. You may run for more than one office, if you win both the position with the most votes will be yours. To be elected to the Student Government/Student Council is an honor with a great deal of responsibility. Only students that are willing to devote a great deal of energy and time to the organization should be considered for election. Both of these groups promote projects for the betterment of the school. YES, you CAN run for more than one position. Forms must be turned in by the due date. You MUST have a 2.0 GPA, 1 or 2 citizenship grades. Can't run if you have been suspended. NO campaigning on social media of any kind - applies to you and your family members. No gifts, candy, stickers, buttons or any items to encourage votes. ONLY 10 flyers (per person no matter how many positions you are running for) - 8x11 on your locker/friends lockers (Can be B&W or Color - No special decorations attached to flyer). 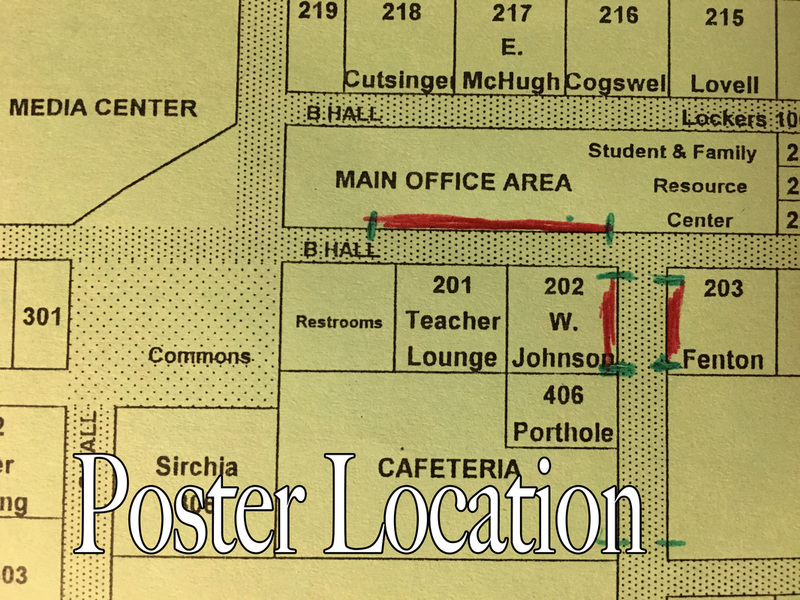 Posters can only hang on designated walls - map below. Can't campaign on morning announcements. If you don't have anything nice to say about your opponent then don't say anything! Failure to adhere to these rules will result in the termination of your candidacy. These rule are in place to keep the election equal. Students interested in running for Student Government or Class Council must download and print the form that applies to the position they are seeking. Return to Mrs. Harris by the end of the school day (due dates are above). *cc stands for Class Council. Where posters can be hung.